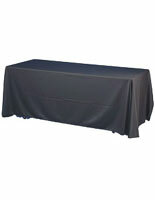 This Table Skirt for Receptions Drapes Over Tables for an Elegant Display! 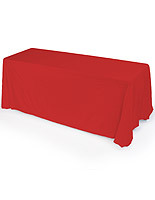 Browse Tablecloths and Covers in Tons of Styles, Colors, and Sizes! 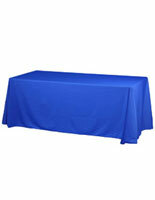 This Affordable Table Skirt Offers Users a Cost-Effective and Ornate Solution! 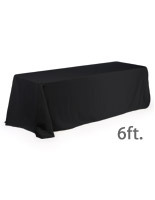 This table skirt covers all four sides of a 6' by 30" by 30" table (totaling approximately 892ft.). 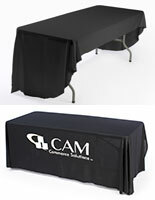 This high quality throw is an economical and eye pleasing way to dress up tables at businesses, trade show expos, and other professional settings. 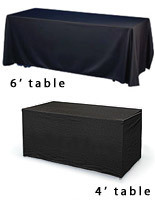 In any environment, the linen cover will successfully complement tabletop displays. 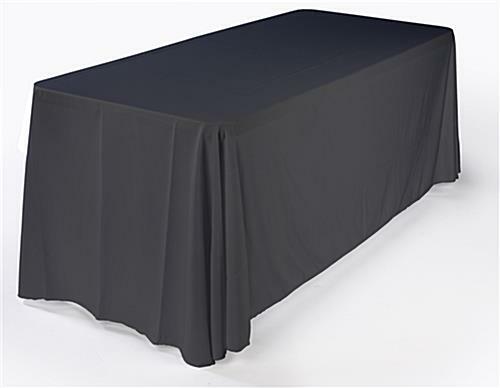 The table skirt falls within 2" of the floor on all sides. This polyester fabric is sewn with four rounded corners. The tablecloth is durable and flame retardant. In fact, each table skirt order is shipped with a flame retardant certificate from an independent testing laboratory. The material is also machine washable and dryable.